Ravenna is a bit different, in that a pause here is not just a question of travel itineraries. 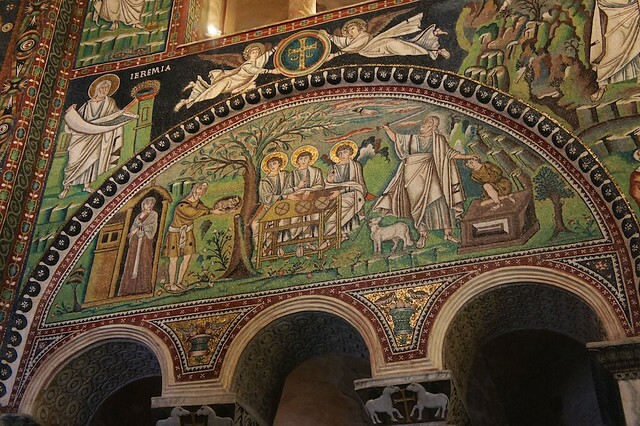 Whether you are coming from or headed to Venice, a stop in Ravenna, famous for its stunning 5th and 6th century Byzantine mosaics, will help you put the sumptuous mosaics in San Marco (created some five to seven centuries later) into the larger context of the evolution of early Christian art. 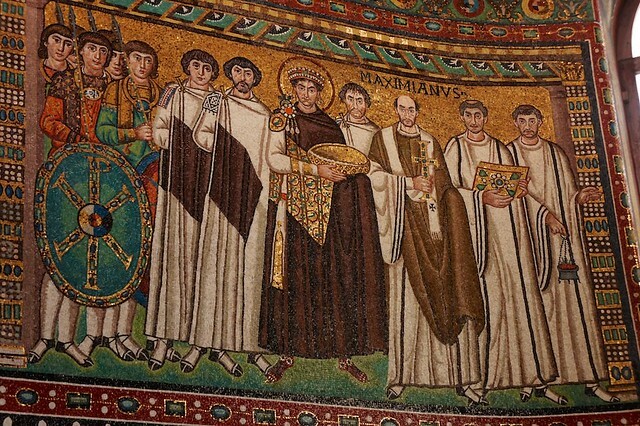 Ravenna’s intricate and well-preserved mosaics are by far its biggest draw. These famed mosaics cover the interiors of a number of churches and sacred buildings (many UNESCO World Heritage Sites) in the historic center of this elegant and modern city. Said to be some of the best examples of Byzantine mosaics in the world, most date from shortly after the Byzantine emperor Justinian reconquered parts of Italy and made Ravenna his western seat of power under his rule from 527 to 565 AD. During his reign, a number of some of the earliest Christian churches in Italy were built and ornately decorated in a style which represents the evolution from the earlier, more natural Roman style to the severe yet spiritual Byzantine. Ravenna’s most famous mosaics cover the choir and apse of this 6th century octogonal basilica, the rather plain brick outside of which belies the explosion of color and composition within. Glittering with gold and eye-popping colors, despite its venerable age of more than 1,500 years, these works depict lush flora and fauna, Old Testament scenes, Byzantine rulers (including Justinian and his wife, Theodora), and Christ with a number of saints. Galla Placidia led an extraordinary life, which she began as a Roman princess, marked by kidnappings, marriages, plots and murders, and a gradual rise to great power during the decline of the Roman Empire. She commissioned this tomb in the 5th century, with a simple exterior but rich interior mosaics (some of the oldest in Ravenna) which cover the walls, floor, and ceiling. Originally dedicated to the Arian cult, this basilica was reconsecrated under Justinian and is decorate by a number of mosaic cycles which date from both its Arian origins and later Byzantine consecration, showing the fusion between the former (Western) and latter (Eastern) artistic styles. The glorious mosaic bands covering the church’s two walls are so resplendent that it is said that Pope Gregory I ordered that they be blackened, as they distracted the faithful from their prayers. For another example of mosaics from the same period, visit the Arian Baptistry, with its depiction of the baptism of a beardless Christ flanked by a pagan river god and circled by the apostles. Don't forget your opera glasses! The mosaics are high up and far away and if you want to get a detailed view you'll need some magnification. Though the vast majority of visitors to Ravenna go directly from bus/car/train to mosaics and back again, there is more to Ravenna if you have time to spare. The city’s historic center is a nice place to explore—largely pedestrian in the center and full of locals biking and walking—and there are a number of other historic and architectural sites worth a visit. 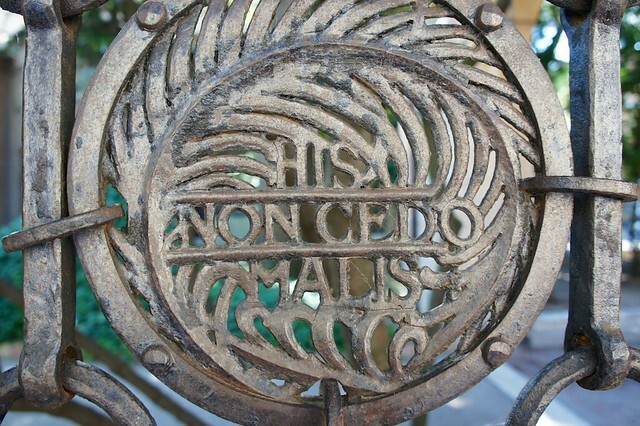 It may come as some surprise, but one of Florence’s most famous sons and author of the deeply Tuscan Divine Comedy was actually laid to rest a region away in Emilia Romagna. 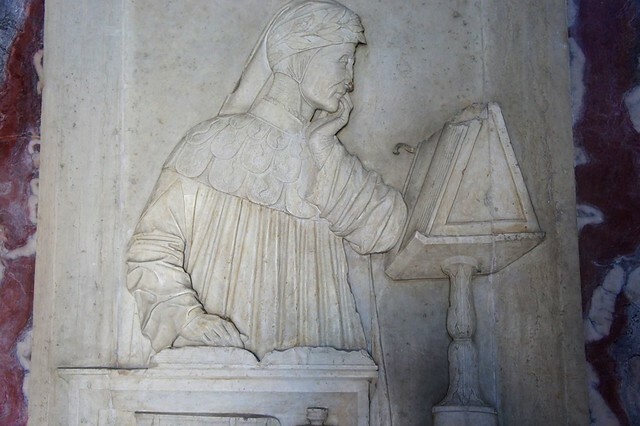 Exiled in his later years for his political views, Dante settled in Ravenna in 1317, where he spent his final four years of life finishing his literary masterpiece. After his death, Florence began to tussle with Ravenna over the poet’s remains, a battle which came to a head in 1519 when the Medicis served Ravenna with a Papal injunction. When the sarcophagus was opened, however, it was discovered that the bones had been hidden, and they were only recovered in 1865. Today, they have been put back to rest in the sarcophagus, and, as an uncomfortable compromise, Florence traditionally provides the oil for the tomb’s eternal flame. Ravenna’s beautiful covered market, dating from the 1800’s, is currently undergoing a massive renovation and is set to follow the footsteps of Florence’s newly renovated Mercato Centrale as a hiphybrid market/restaurant/gourmet/tasting space. Just a few blocks from both the Basilica di San Vitale and the Mausoleum of Galla Placidia, this was in the past (and will soon be again) a bustling spot to rub elbows with the locals, sample some of Emilia Romagna’s excellent cuisine, and get a taste of the centuries-old market tradition in Italy that is, thankfully, making a comeback in many Italian cities. Ravenna’s MAR art museum is a palate-cleanser after the Byzantine immersion of its historic center. Though there is a section for works spanning the 14th -19th centuries, the most interesting collections are the contemporary galleries, including a fascinating group of modern mosaics made from sketches commissioned from Italy’s (and Europe’s) most important modern and contemporary artists. Our favorite restaurant in Ravenna is Osteria l'Acciuga, specialized in excellent fish and seafood dishes so fresh that you are reminded that the Mediterranean is just a few kilometers away. 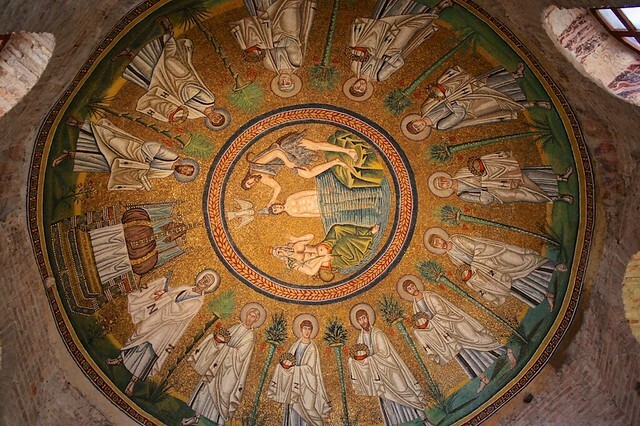 The Ravenna Festival held each year from spring through fall and features opera and classical music concerts in a number of fabulous venues (including beneath the glittering mosaics of its most famous churches) in the center of town. 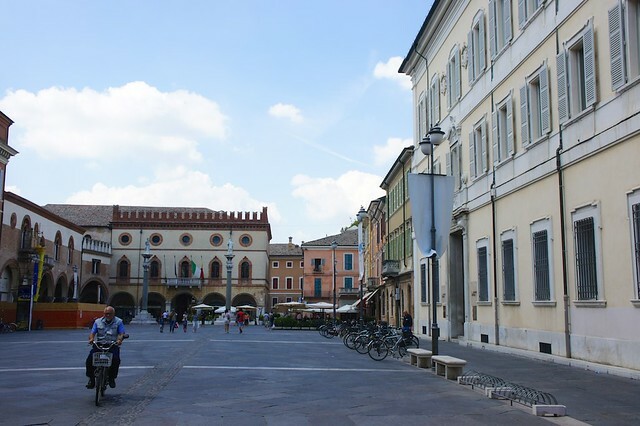 For the past 30 years, the third weekend of each month Ravenna holds a sprawling antique and collectors’ market in the historic center, with dozens of stands selling everything from the precious to the quirky.